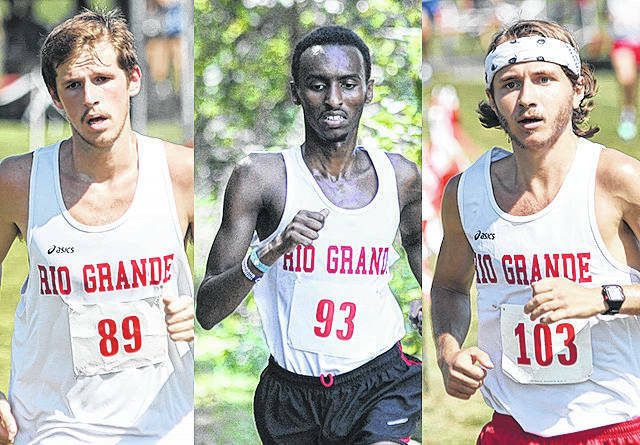 From left, Rio Grande’s Kameron Carpenter, Mohamed Farah and River Spicer all earned spots in the NAIA Men’s Cross Country National Championship based on their finish in Saturday’s River States Conference Championship hosted by Asbury University. Carpenter placed seventh, Farah finished eighth and Spicer crossed in 11th place. WILMORE, Ky. — Three individuals from the University of Rio Grande earned the right to run for a national championship based on their finishes at Saturday morning’s River States Conference Men’s Cross Country Championship hosted by Asbury University. Junior Kameron Carpenter (Newark, OH), freshman Mohamed Farah (Galloway, OH) and sophomore River Spicer (West Milton, OH) will be representing the RedStorm at the NAIA National Championship, which is scheduled for Nov. 18 in Fort Vancouver, Wash.
Carpenter finished in seventh place with a time of 27:51, while Farah grabbed eighth place in 27:52 and Spicer traversed the 8k course in 28:24. As a team, Rio Grande finished third with 75 points and missed qualifying for national championship as a unit. Ohio Christian University (49 pts.) and Point Park University (61 pts.) finished in the top two spots to earn the RSC’s two team qualifying bids to the national championship. The top six individuals who aren’t part of the two qualifying teams – including the trio of Rio runners – also advance. West Virginia University-Tech’s Robert Jones had the top time in the 99-runner field with a finish of 27:08. Also representing Rio Grande in the race were freshman Isaac Stephens (Arcanum, OH), who placed 20th in a time of 28:59; sophomore Keshawn Jones (Mansfield, OH), who was 30th after crossing in 29:37; freshman Alan Holdheide (Fort Loramie, OH), who was 37th in a time of 29:59; and freshman Alec Coleman (Ashland, OH), who finished 43rd in a time of 30:17. The conference also announced a Champions of Character Team. Rio Grande was represented by freshman Dean Freitag (Magnolia, OH).